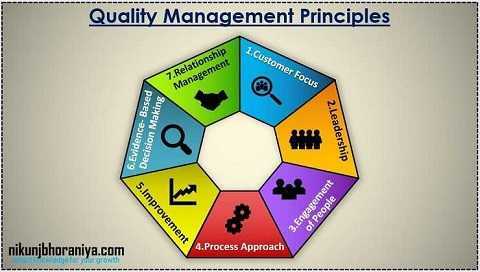 What is Quality Management Principle in ISO 9001? → Quality Management Principles are a part of the ISO 9001 Quality Management System's Requirements. 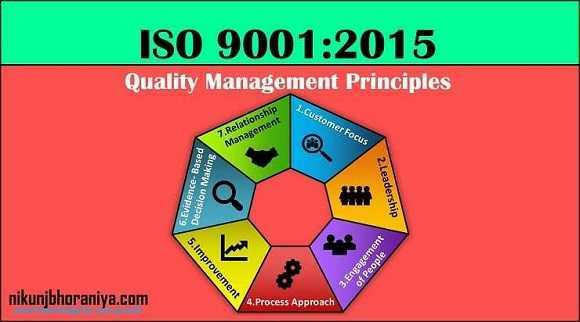 → ISO 9001 is based on the Seven Quality Management Principles. → They are also useful resources for management professionals looking to implement or improve a Quality management program. → The primary focus of quality management is to meet the customer's requirements. → This principle is about understanding the needs of our existing and future customer. → It aligns organizational objectives with customer's needs and expectations. → This principle is all about the meet customer's requirements, ensure the level of customer satisfaction. → Leaders of an organization establish direction, unity of purpose and create a condition in which people are engaged in achieving the quality objectives and the common goal of the organization. → Leadership establish a vision and direction for the organization and set the goals of the organization. → This principle is also established trust and recognize the contribution of employees. → All people within the organization must be competent, empowered and engaged in delivering value. → Engagement of People is about to ensure people’s abilities and enable participation in various continual improvement programmes. → This principle evaluates the performances of employees, it enables learning and knowledge sharing and brainstorming of problems and constraints in an open forum. → The process approach is a management strategy. → When managers use a process approach, it means that they manage and control the processes, the interactions between these processes, and the inputs and outputs that tie these processes together. → Process Approach manages all organizational activities as processes and also measures the capability of organizational activities. → This principle Identify linkages between activities and prioritize improvement opportunities. → Improvement is related to ongoing improvement related activity in an organization. → This principle is about to improve the performance of an organization. → Motivate the improvement activities within the organization. → Empower people to make continual improvements. → Evidence-Based Decision Making is a decision-making process based on the data or performance of product or process. → It ensures the accessibility of accurate and reliable data and uses appropriate methods to analyze data. → This principle promotes decisions making based on analysis and practical experience. → Organizations manage their relationships with their all suppliers. → Relationship Management is about to Identify and select suppliers to manage costs, optimize resources, and create value for the organization. → Short term and long term relationship building. → It Collaborates on improvement and development activities with the stakeholders.